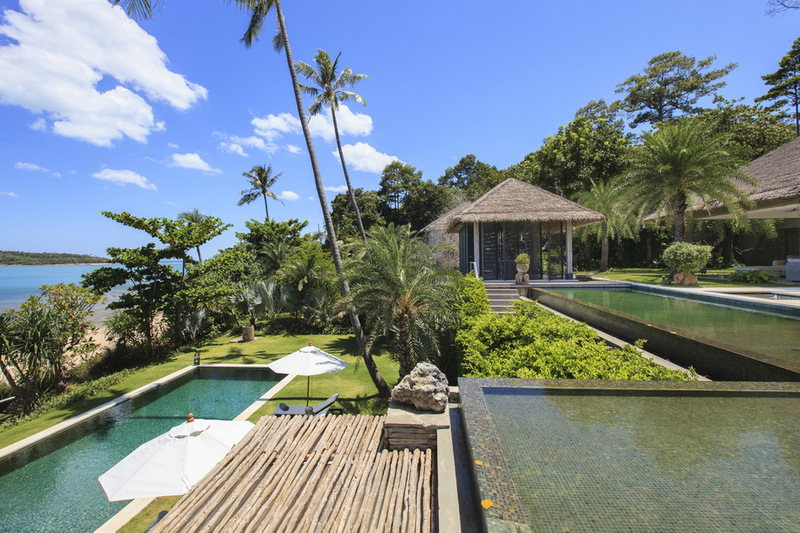 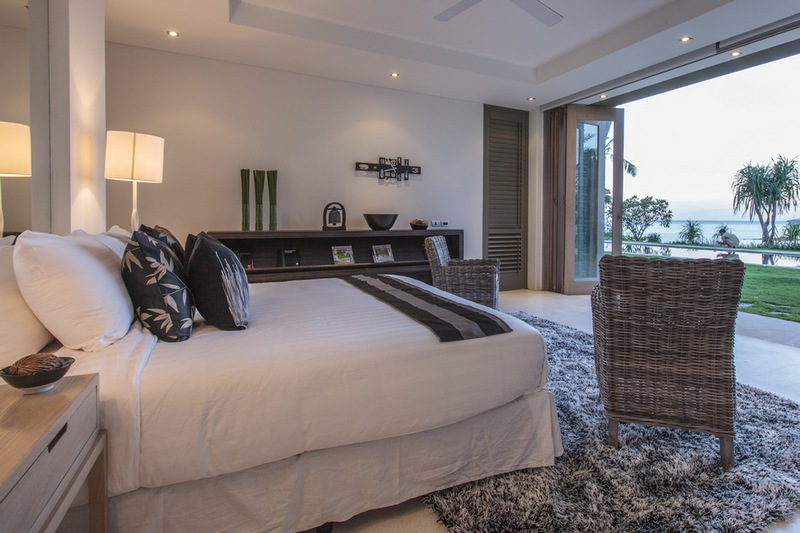 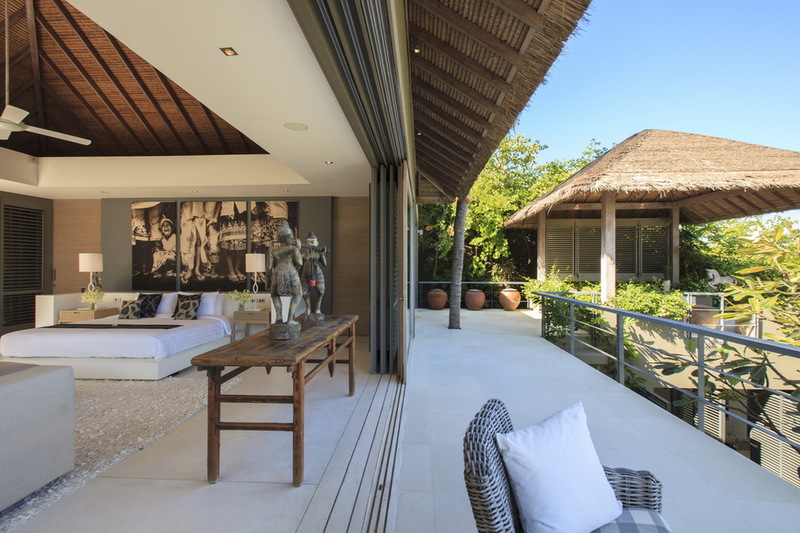 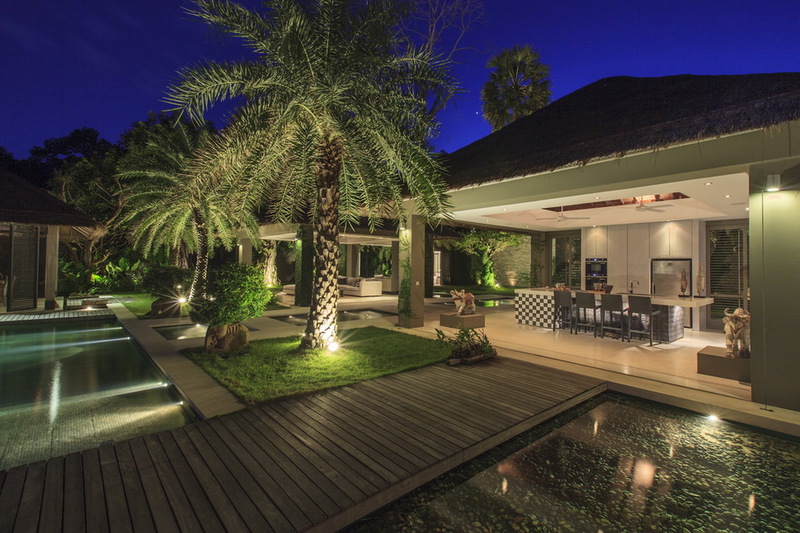 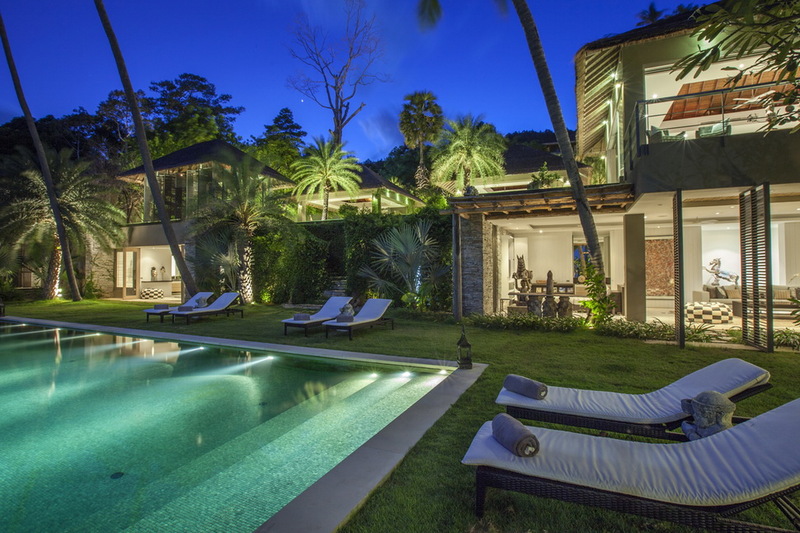 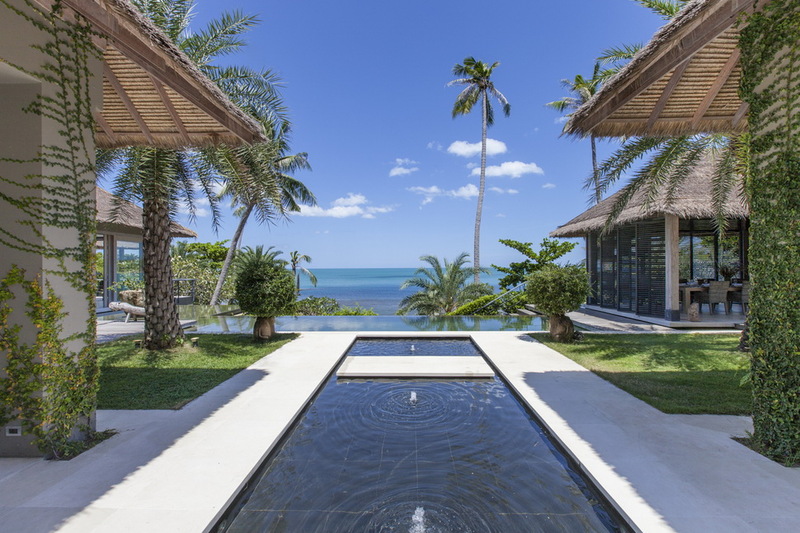 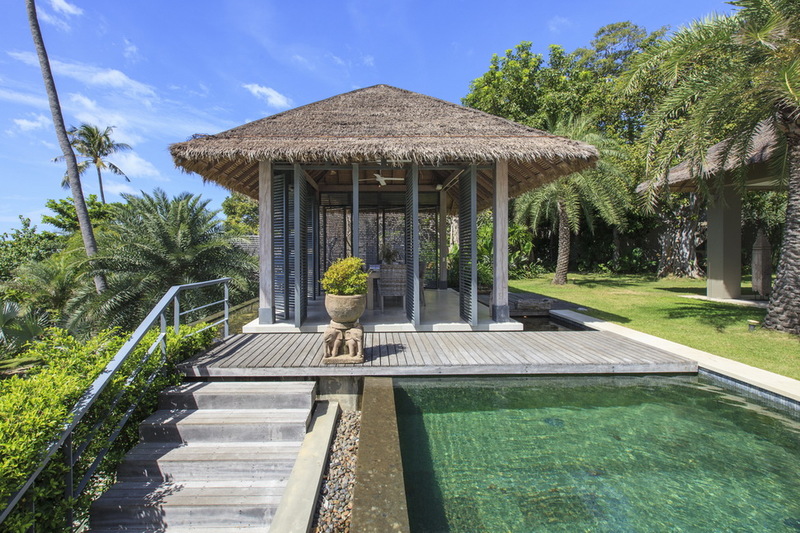 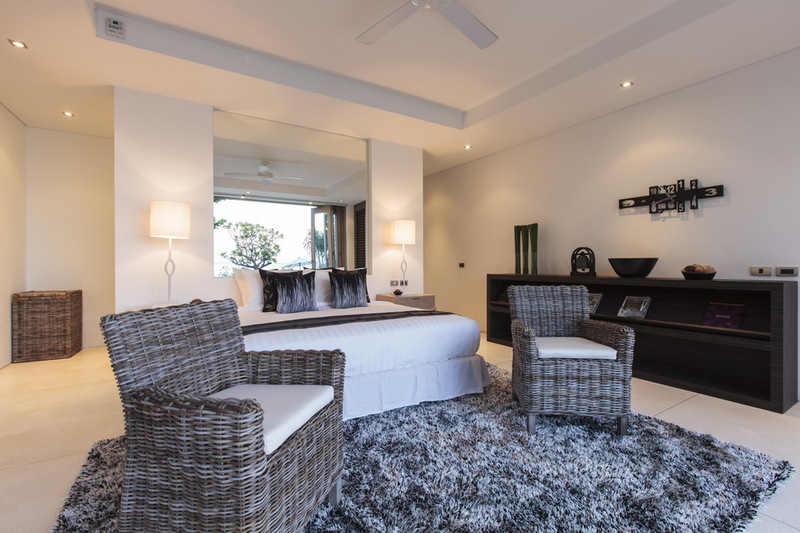 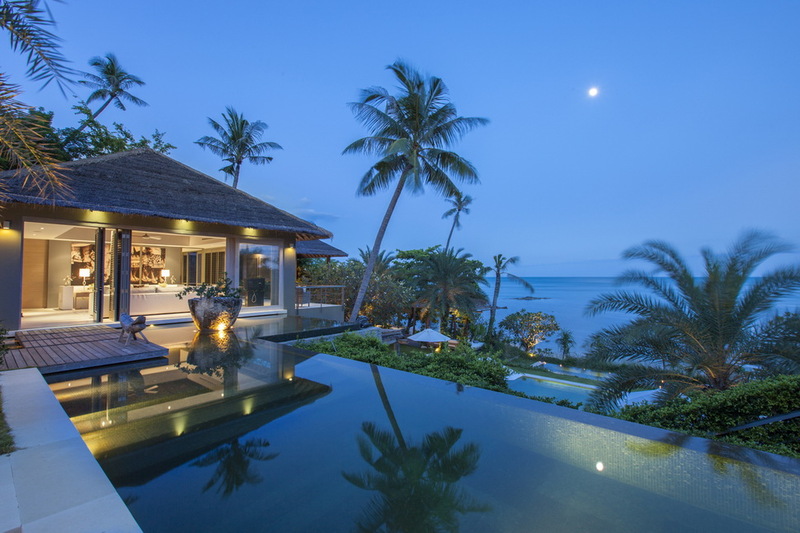 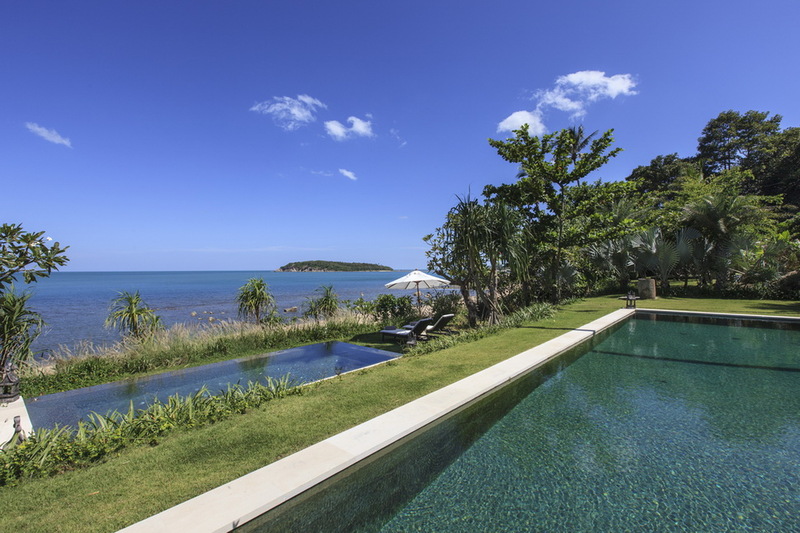 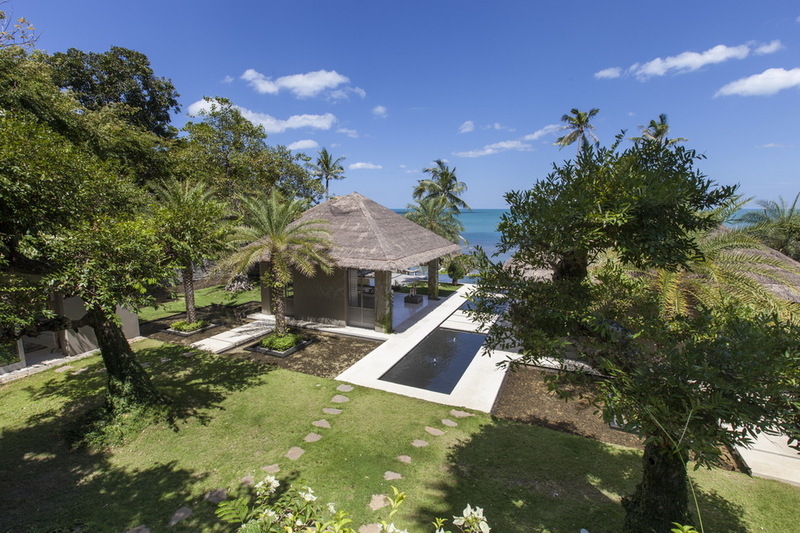 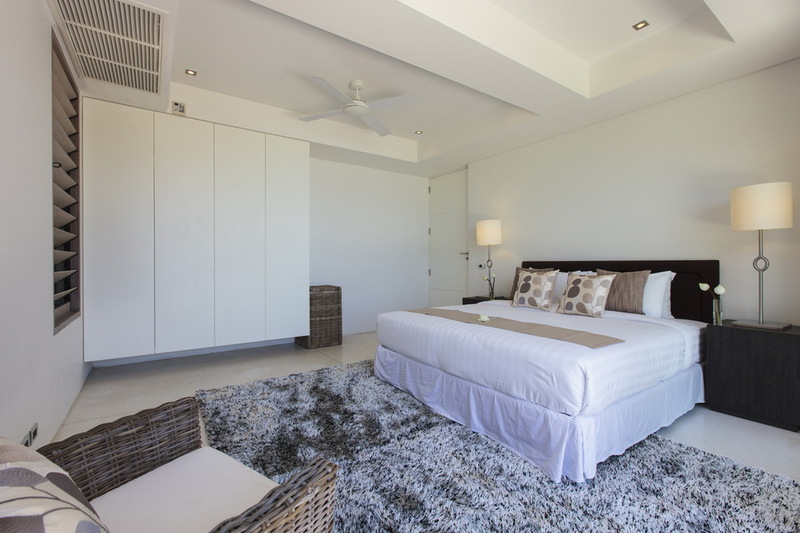 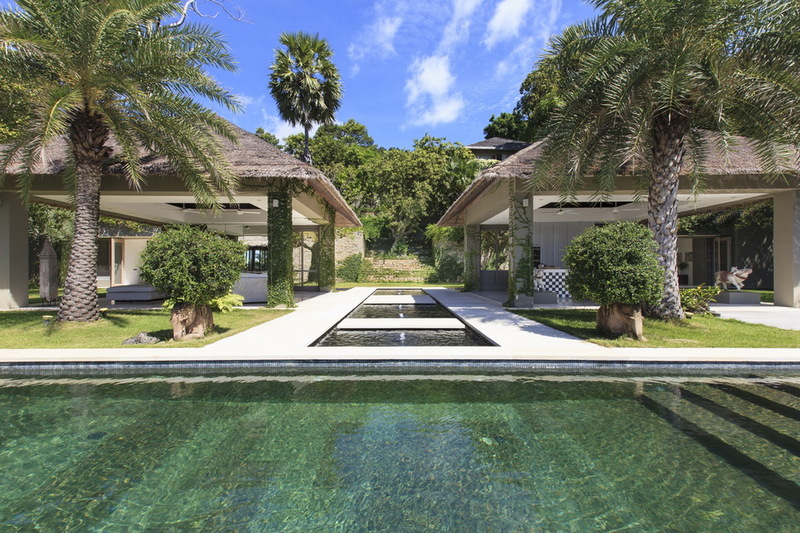 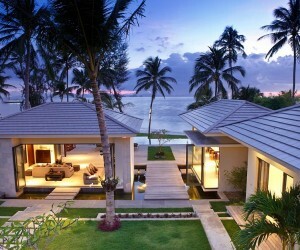 Villa Sangsuri 2, on Koh Samui in Thailand, is one three luxury holiday homes on the awesome Sangsuri Estate. 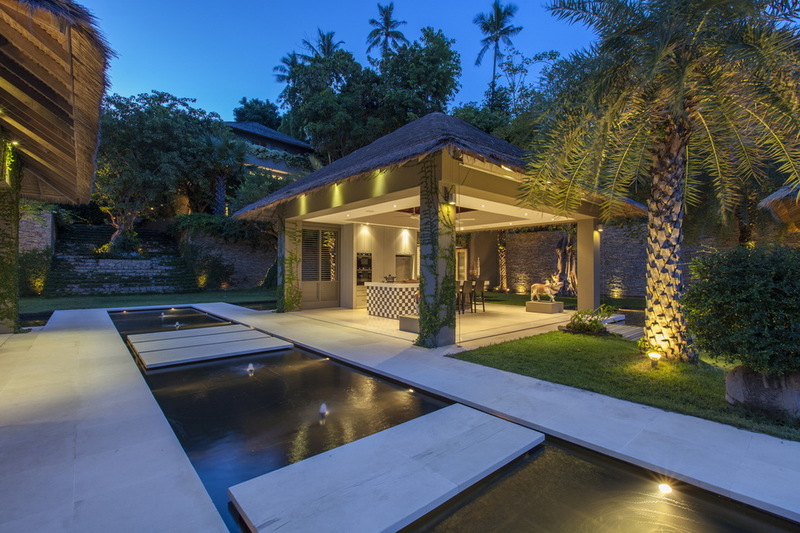 This six bedroom property is situated on tropical landscaped grounds, as a group of stand-alone pavilions that have been set over four levels. 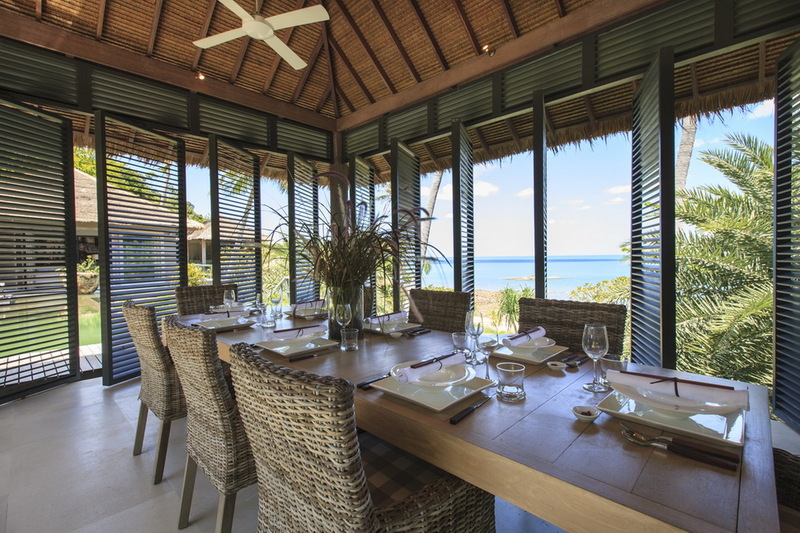 Holiday home life can flow through the beautiful exterior spaces as family and friends move between the separate living and sleeping spaces, and the sea air and view of the beachfront can be fully enjoyed. 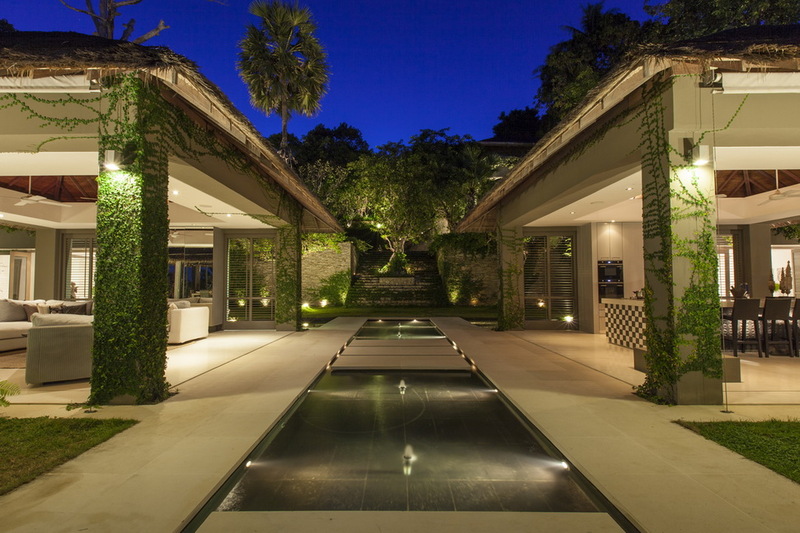 Delicate climbing plants feather the clean edges of the contemporary structures, and established palm trees provide small areas of shade along the walkways and lawns. 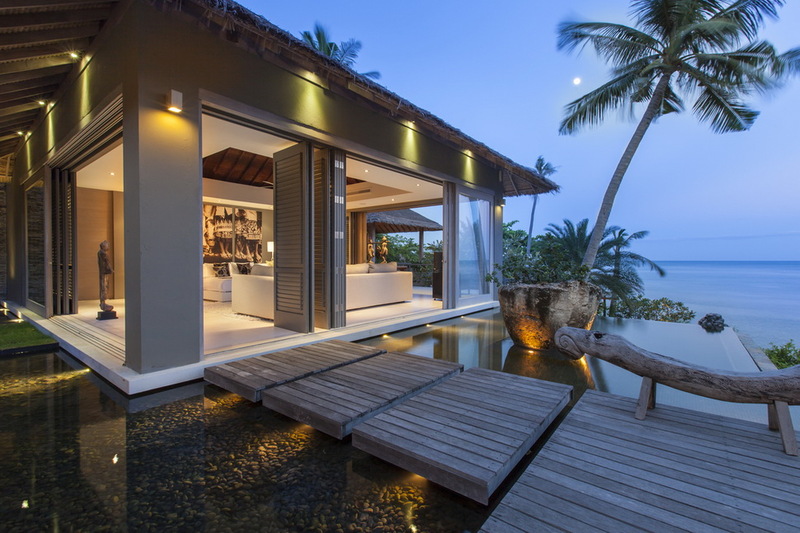 A softly bubbling body of water is bridged to provide unobstructed access between areas. 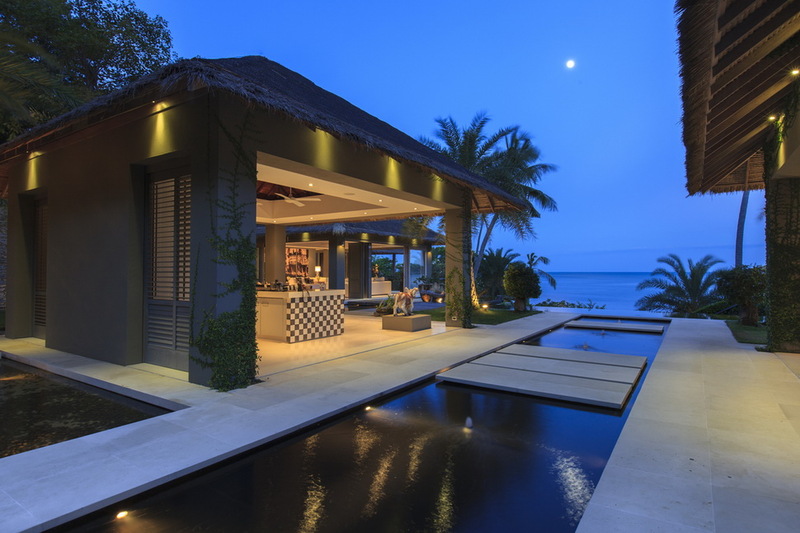 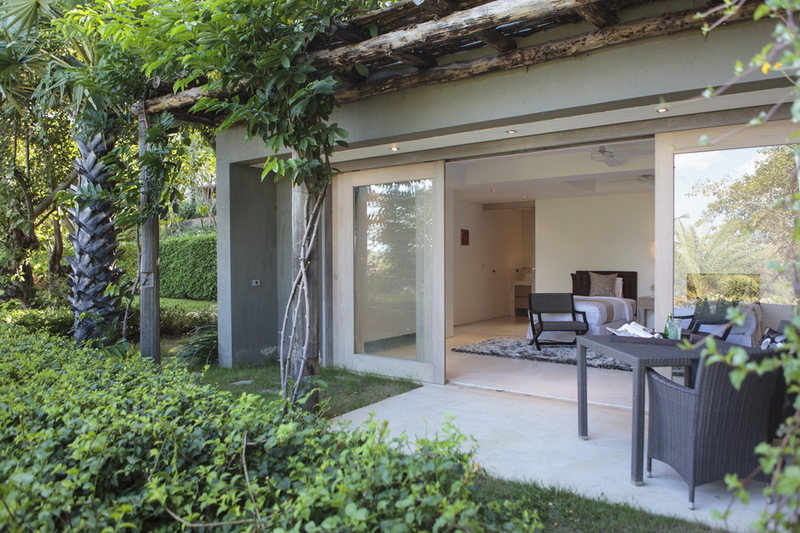 Sliding wooden shutters close off the pavilions to provide cozy comfort during the evenings. 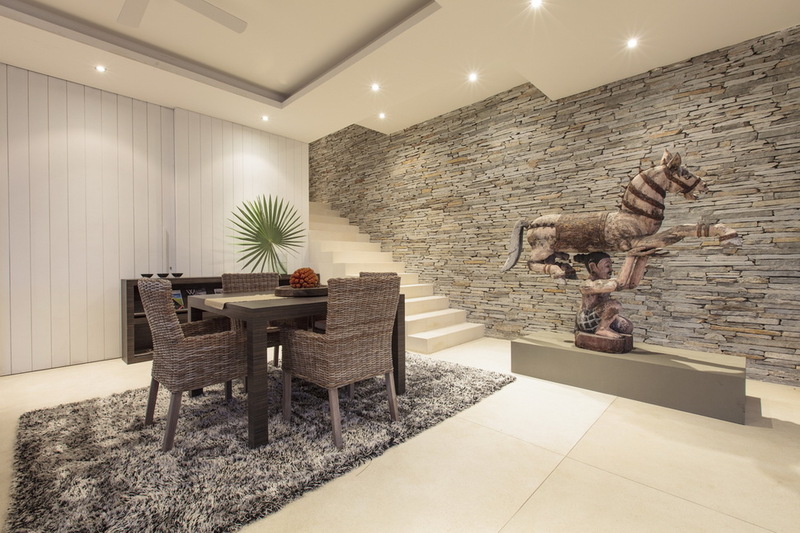 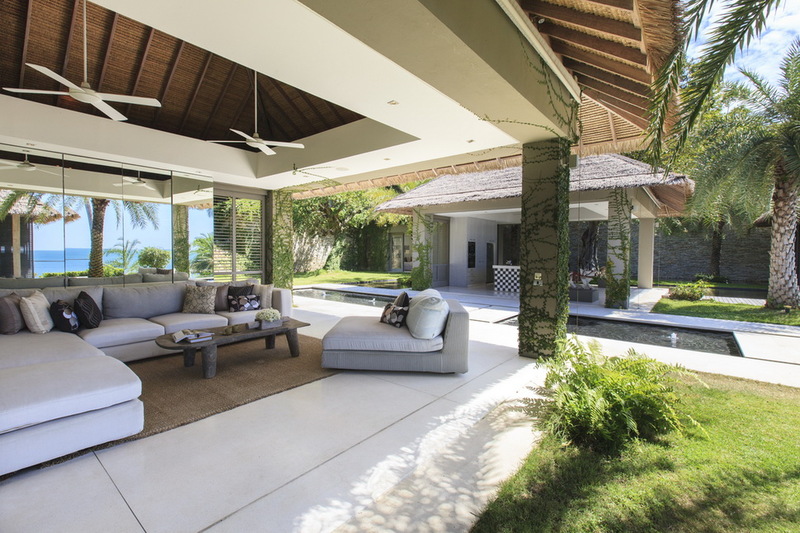 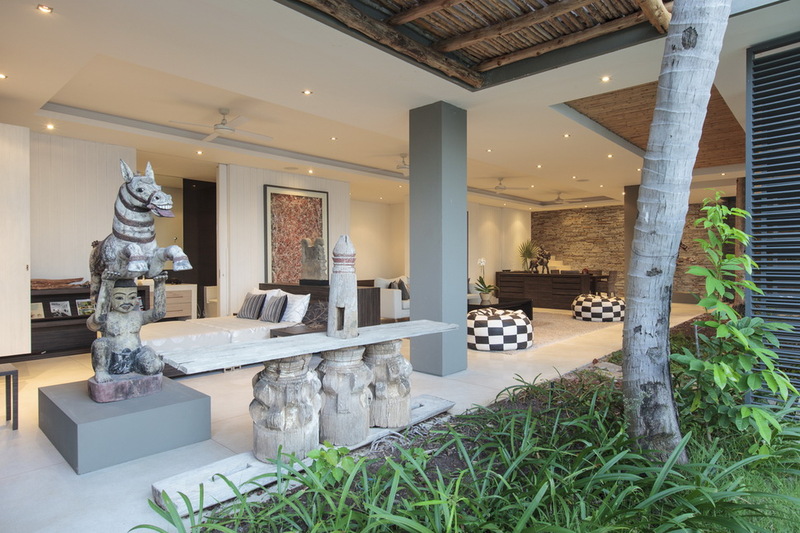 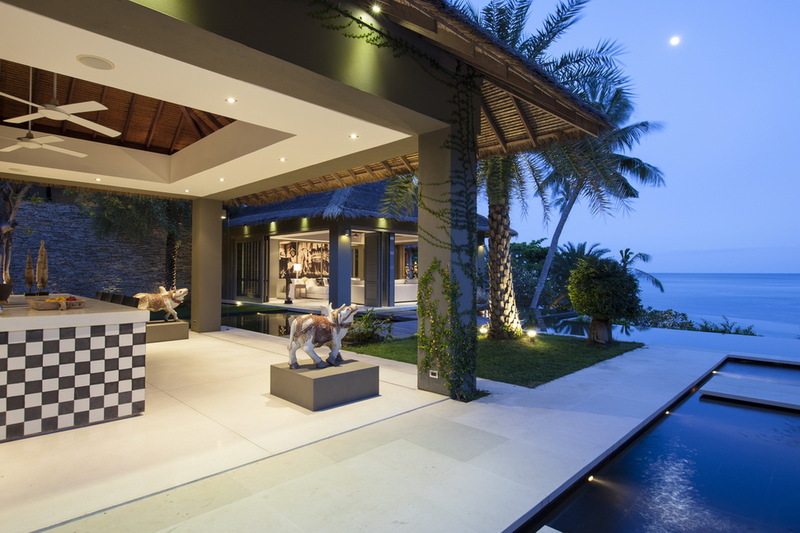 Indoor-outdoor living has been made absolute key in this luxury villa design. 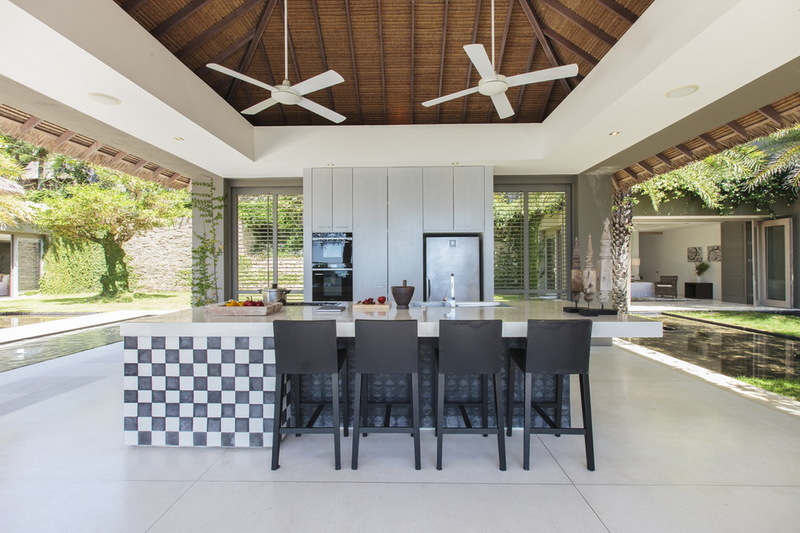 Multiple outdoor dining areas provide plenty of alfresco opportunities, and the walls of the kitchen-dining and lounge pavilions are none existent so that not one moment is wasted in being cooped up indoors when cooking, replenishing and relaxing. 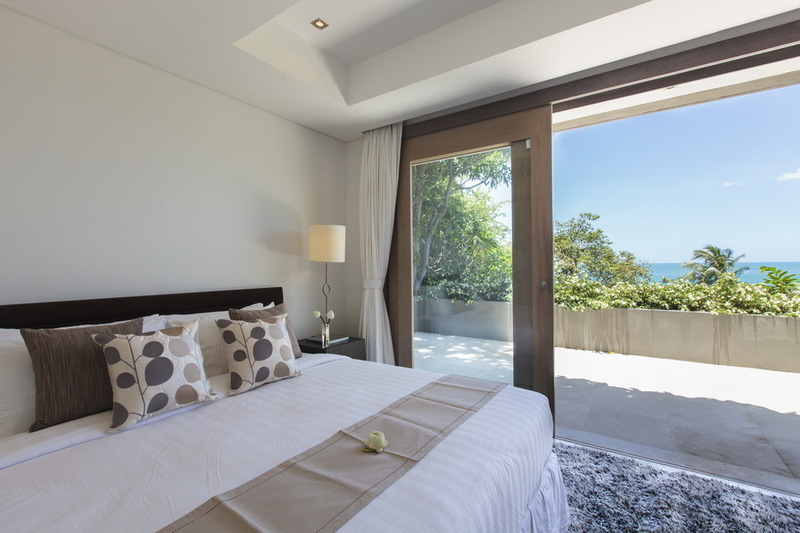 Glass walled rooms soak in the sunlight and the ocean views. 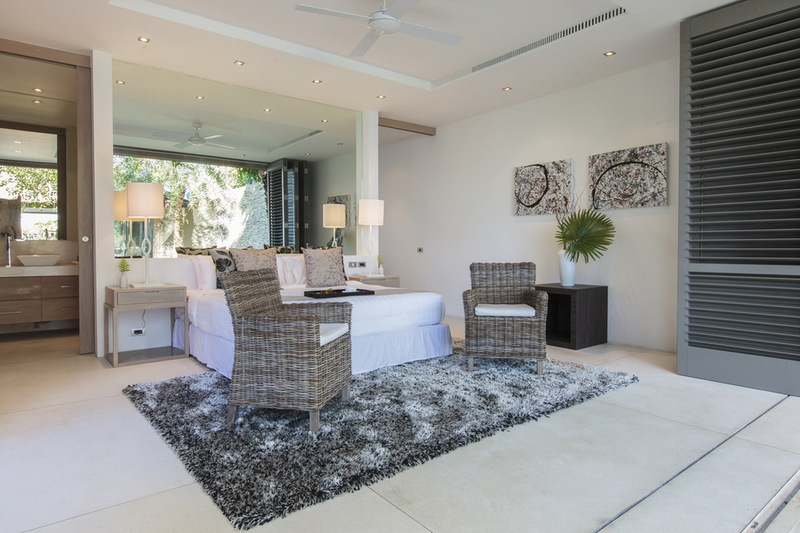 Large bedrooms open onto private terraces and gardens, whilst the master bedroom pavilion is fronted by an infinity edged plunge pool. 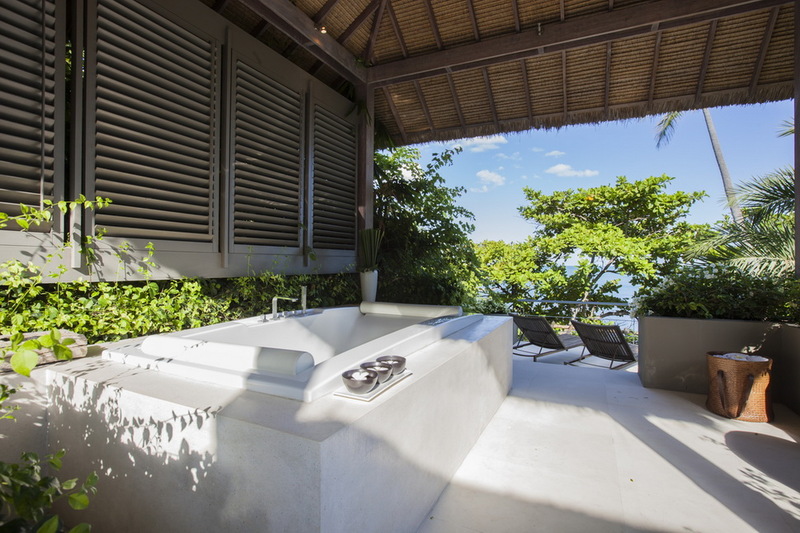 Antique Balinese wooden carvings and original artwork decorate the master sleep space, and a big bathtub awaits the dweller out under a clear blue sky. 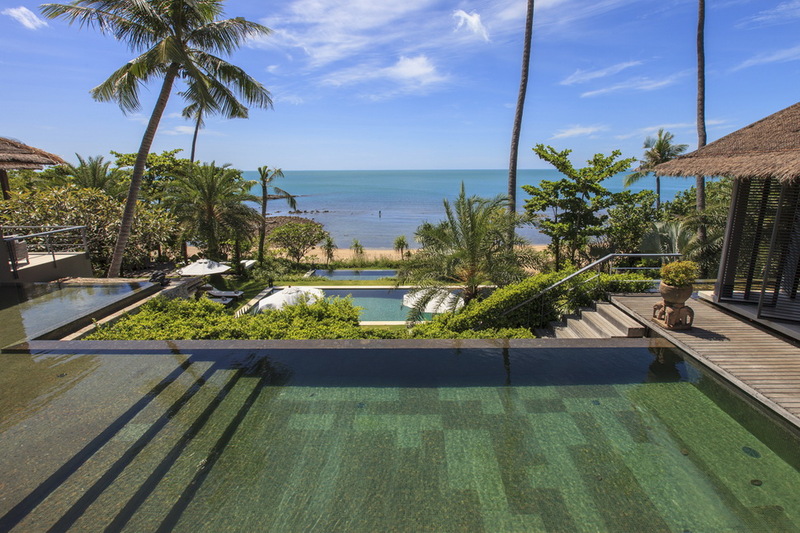 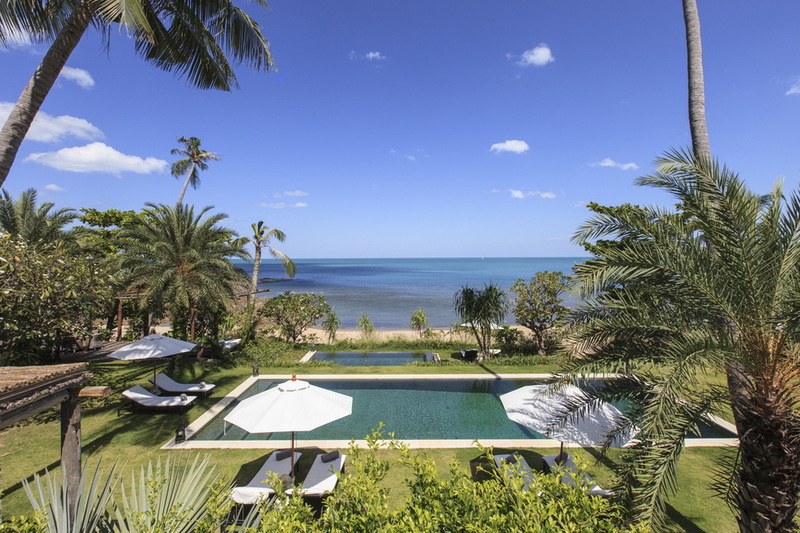 Two ocean view swimming pools and a generous beachside jacuzzi are close at hand. 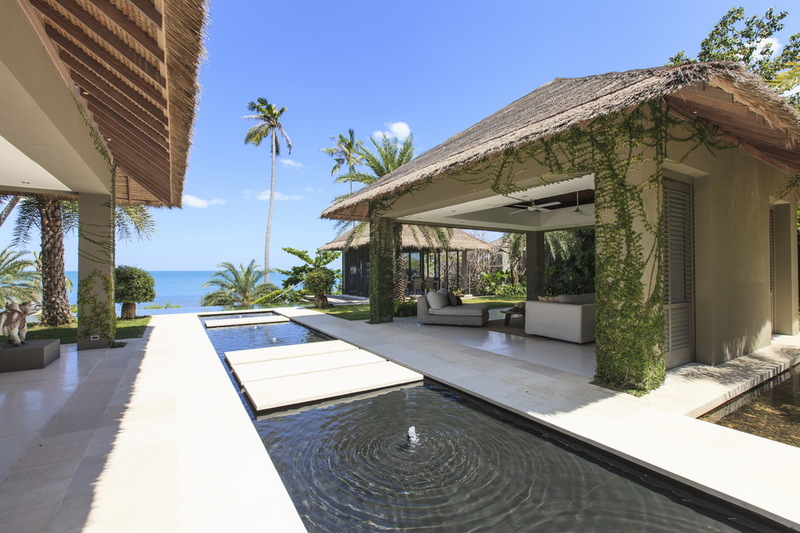 Thatched roofs over the pavilions bring a lovely tropical island look to the otherwise crisp constructions. 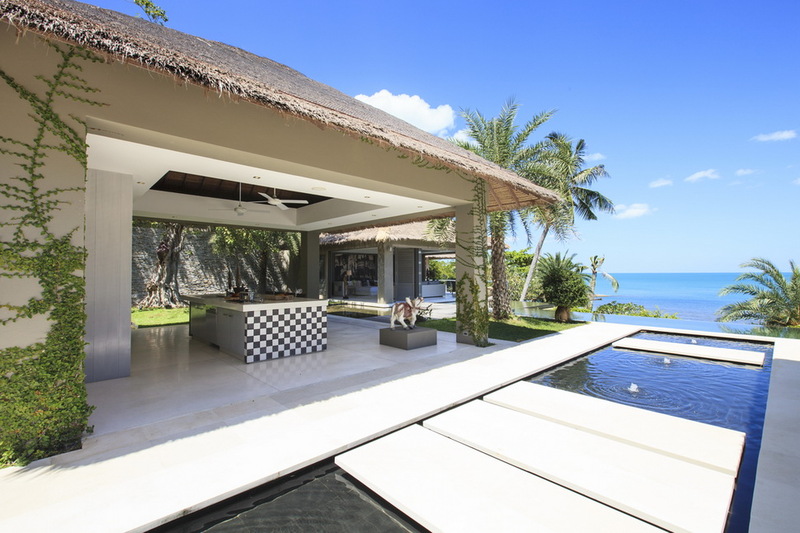 The decor of each structure on the complex is sophisticated and modern but with elements of natural elegance, demanded by the stunning location. 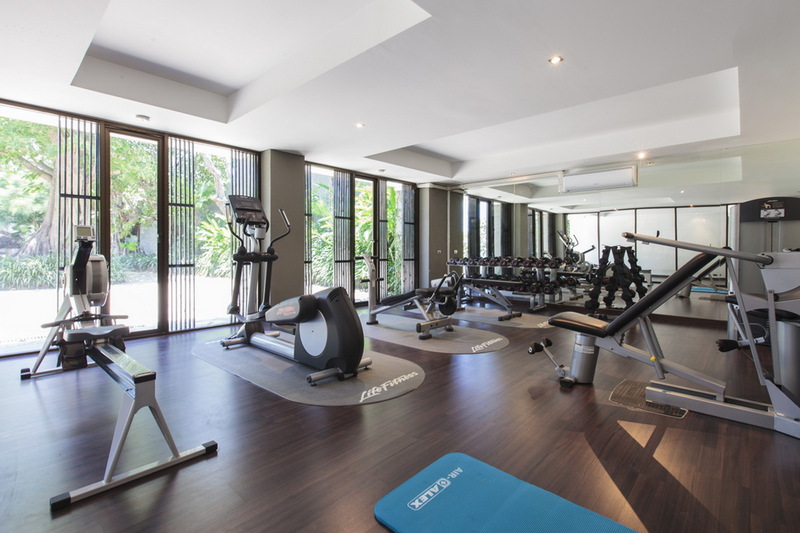 A private gym is provided for guests who don’t want to kick-back 24-7. 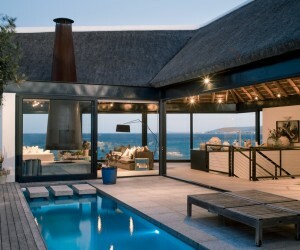 A beachside terrace holds a barbecue area that supplies a ten seat dining table, and a daybed that looks over a jacuzzi. 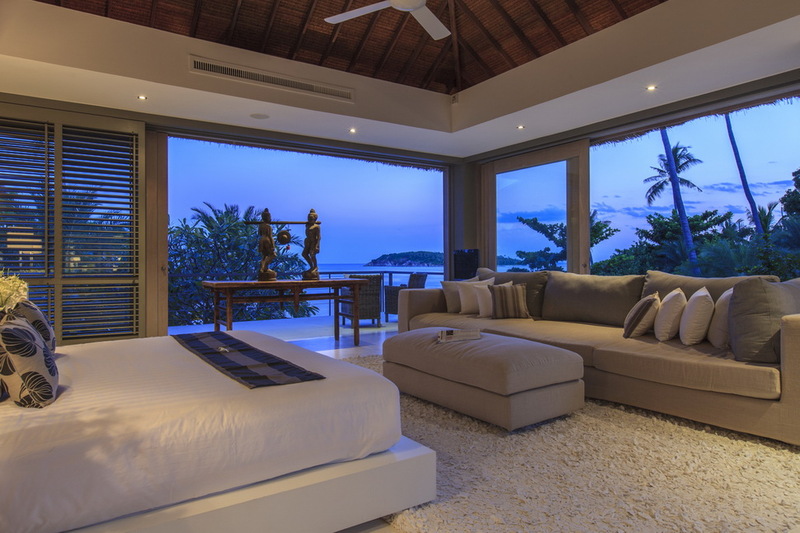 Sea views from the bed, bliss!